Good Morning! 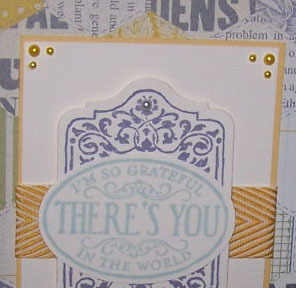 Today I am posting a card that I made with some of the new stamp sets and designer paper from the new catalog! I love the combination of colors in this card. This card is made with the Afternoon Picnic designer paper. The cardstock is Pool Party for the base, with a layer of Wisteria Wonder. THe tag in the center is So Saffron (my stand-by yellow). I stamped the tag in Wisteria Wonder ink and cut it out with the Chalk Talk framelits. The There’s You is stamped in coastal cabana (one of the new in-colors) and punched out with the large oval punch. Don’t forget that the Chalk Talk stamp set and framelits are a bundled set and there is a discount for ordering the two together (pg. 12). This is a great versatile set with greetings for any occasion. Just pair it up with your desired designer paper. Then the corners looked a little bare to me, so I embellished them with the pearl jewels. You can color the pearls with a sharpie marker – so I made them to match the so saffron cardstock and added a regular pearl to the center of the Wisteria Wonder tag. All of this is layered on a piece of the new So Saffron Chevron ribbon! Enjoy this beautiful day!! Interested in placing an order? I have an open order that I will be closing tomorrow June 16th. The hostess code is UCAPRQQP. Enter this number on the order screen and your order will go into the queue immediately and ship directly to you. No more waiting for my orders to close and then to ship! !